Soon, defiant little girls cast in bronze will become the de facto symbol of gender discrimination the world over. 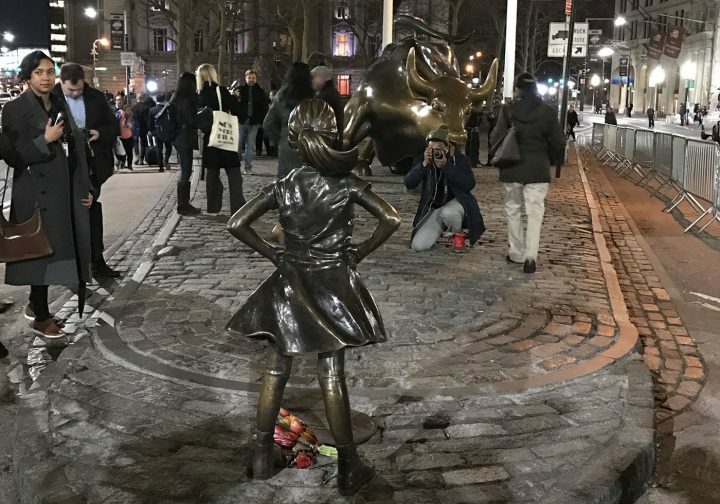 It was bad enough when a giant Wall Street firm planted a sculpture of a young girl as a PR stunt for International Women’s Day, and everyone fawned over it. Now the California Democratic Party (CADEM) has emulated the trick by placing its own version of “Fearless Girl” on the roof of its headquarters. Soon, defiant little girls cast in bronze will become the de facto symbol of gender discrimination the world over. When I first ranted about the “Fearless Girl” sculpture on Wall Street, I called it “the most conceivably non-threatening version of womankind.” Remarkably, CADEM has managed to offer an even more infantilized version of womanhood by casting a girl with a softer stance and pigtails. Made by artist Julia Fernandez-Pol, the sculpture is based on Democratic strategist Dana Williamson’s five-year-old daughter — who I’m sure is awesome and inspiring. But what is she doing on the roof of the CADEM headquarters? “Little girls need something to look up to,” Robin Swanson, a Democratic communications consultant, told the LA Times. “They can literally look up at the statue of ‘persist’ and say ‘I can persist.’” Um … OK. But one of the beautiful things about art is that it doesn’t have to be so painfully literal. And one of the failures of both “Fearless Girl” and the CADEM sculpture, which is titled “Persist,” is that, rather than using literalism in a thoughtful way — by, say, honoring path-breaking women in history — they instead trade on a very superficial, feel-good symbolism. In the case of the former, even though State Street Global Advisors disavowed any political statement, the placement of the statue in front of Wall Street’s “Charging Bull” at least gives the girl some meaning (she’s staring down corporate-driven capitalism). In the case of the latter, it’s a genuine puzzle what obstacle she’s confronting (the reinforced roof? the polluted air? the California Democratic Party?). Never mind the issue, though — from structural inequality to rampant global misogyny, these heroic, nameless girls can face anything! I realize I sound jaded. I am. I believe that young girls have enormous potential (and the ones in the CADEM “persist” campaign photo look a lot more inspiring than the sculpture). But with corporate feminism so in fashion and the conditions of women’s lives — especially those of women of color — so deficient in this country, it’s on State Street Global Advisors and the Democratic Party to prove they’re actually working to advance gender equality. Until then, I’ll remain skeptical of their symbols.